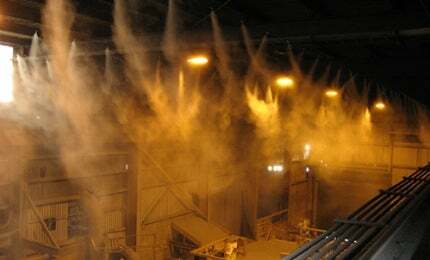 Access Environmental Systems (AES) is a specialist in high-quality fogging and misting systems for commercial and industrial applications. The changes in industrial and commercial laws, as well as environmental practices, have led to the introduction of AES’s Coolfog system, designed to target three key areas: dust suppression, heat reduction and odour control. AES provides modern state-of-the-art solutions to control dust, odour and temperature levels in a range of industries. The company designs, manufactures, installs, commissions and services fogging system technologies. AES’s Coolfog systems pressurise water at 1,000psi through nozzles, which are designed to produce water droplet particles (fog) that evaporate into the atmosphere within seconds and reduce the surrounding temperature. The fog also encapsulates and suppresses dust particles present in the atmosphere while falling to the ground. All Coolfog pump control modules are manufactured using stainless-steel frames and covers, as well as high-quality weather-resistant, non-corrosive parts and fittings, ensuring a longer service life. Nozzles are available from 0.2mm up to 1.2mm orifices, with flow rates from 0.07l / min to 0.483l / min at 1,000psi. System designs are available with pump control module featuring between ten and 770 nozzles each. All the main, delivery and fogging lines are manufactured from nylon high-pressure tubing, which is UV-stabilised, flexible and pushes into special push-fit nozzle couplings, tees and elbows. It facilitates the installation of Coolfog systems. The fogging lines that are suspended off the ground are usually installed by fixing to a PVC-coated, stainless-steel catenary cable that is suspended the length of the building or directly to a fixed structure. Independent tests conducted by Airlabs Environmental confirm Coolfog is highly effective at reducing airborne dust. Particle sizes of 10µ were reduced by 65.3%, while particles sizes of 2.5µ decreased by 79.2%. AES resells water-driven injectors by US company Dosmatic, which provides cost-effective solutions for the industrial, horticultural and animal health markets. Chemicals, cutting fluids, degreasers, disinfectants, fertilisers, polymers, sanitisers, pesticides, soaps, waxes and other water-soluble products can be easily injected with precise and accurate dispensing. Dosmatic manufactures injectors with flow rates ranging from 0.11l / min (0.03usg / m) to 758l/min (200usg / m), with feed ratios varying from 0.025% (1:4,000) to 10% (1:10). The inlet and outlet connections and operating pressures vary depending on the model. All the Dosmatic injectors are resistant to a wide range of chemicals. A super corrosive transfer (SCT) kit is available to easily retrofit existing Advantage A20, A30 and A40 units. The SCT Kit allows more aggressive and corrosive chemicals, including iodine, chlorine and hydrogen peroxide, to be injected for water treatment. AES is based in Brendale, Queensland, Australia, where our marketing, production, service support, technical and product development is carried out. AES also has a national network of service technicians covering most of Australian territories. AES has formed strong partnerships with leading manufacturers that can provide equipment for incorporation into a Coolfog system or supplied independently as required. These working relationships have allowed the company to not only continue to satisfy its client’s specific needs, but to also extend its product range and widen its commercial appeal. In January 2003, AES obtained its first overseas order to supply and install the Coolfog system in a UAE foundry and has since expanded its product range to markets in India, New Zealand, Oman, Saudi Arabia, the UK, Spain and Canada. AES has become a successful small company operating in the ever changing global market place. Our company offers our customers a personalised, tailored approach to head, dust and odour control solutions.